I wanted to mention a little church some way from York, 6 miles or so from Helmsley. We visited it while out walking a couple of months ago, and I wanted to include a page on it then. It has come to mind again today, on Remembrance Sunday. 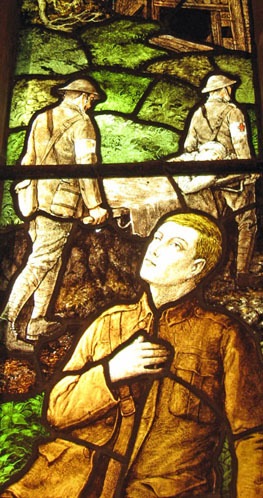 Its stained glass windows are striking early 20th century designs, including this representation of a battlefield scene from the First World War. 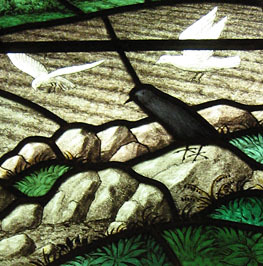 It’s not the kind of thing you normally see in stained glass windows. A young soldier in the foreground, in uniform. Behind him one of his comrades carried away on a stretcher. 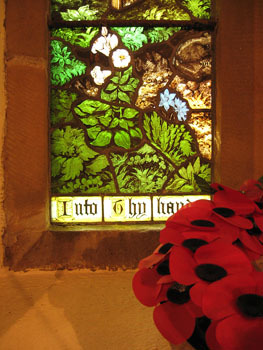 The other side of the window, not shown on this photo, has a more conventional image of Christ on the cross. The young soldier is looking upwards to Christ. 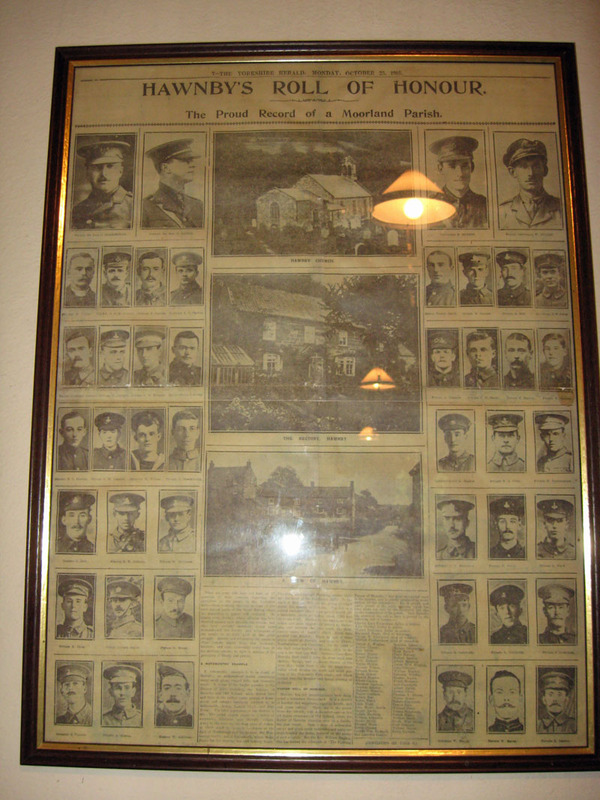 The Yorkshire Herald of 23 October 1916 included a lengthy piece on this parish and its contribution to the war. The newspaper is framed and yellowing on a wall at the back of the church. It’s something many of us find it difficult to understand, the way the Established Church appears to embrace armed conflict. A particularly enthusiastic fighter at the time of the First World War was the Revd William Hughes, ‘the fighting parson of Hawnby’, who had inspired 61 of his parishioners to sign up by 1916. This included his own loved ones. He lost three sons in the conflict. 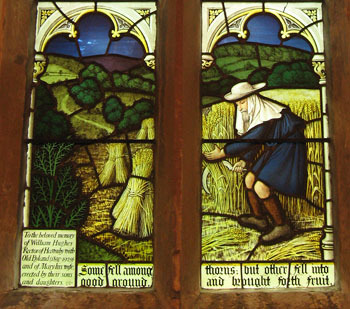 A detail from another of the church windows, one dedicated to the memory of Reverend William Hughes. It has an equally striking design, apparently by the same artist. Rural scenes are beautifully depicted, with rolling fields, birds and vegetation. The church, right alongside the narrow, winding River Rye, is in what we’d call an ‘idyllic location’, though not so idyllic when the floods come. One of the many helpful pages of information provided in the church mentions the floods of June 2005. The flood left the church standing in 2ft of water, and knocked over many of the headstones in the churchyard. Order had been restored by the time of our visit, and this was once again an idyllic rural scene, with worn headstones around the church, blending in to the landscape, covered in lichen. Inside, poetry, printed out and placed on the windowsills. Like many remote Yorkshire churches, this tiny place said so much. The information provided in the church included a name I recognised. The ‘associate priest’ is the Reverend Michael Sinclair – a former Chairman of York City football club, fondly remembered by supporters. By Lisa @YorkStories • 11 November 2012 Beyond York, First World War To link to this page's proper location please use the > permalink. These images are beautiful – amazing in such a small village. They are wonderful windows, aren’t they. Glad you liked them.